My Momma has a large, blank canvas (literally) covering her electrical box in her basement. It’s painted the same color as the walls so it blends in, but it was so empty and screaming for some sort of decoration. At Christmas, Mom puts a wreath on the canvas. So I said, why not make a wreath for the rest of the year? So Momma and I headed to Michaels today to pick out supplies for her wreath. 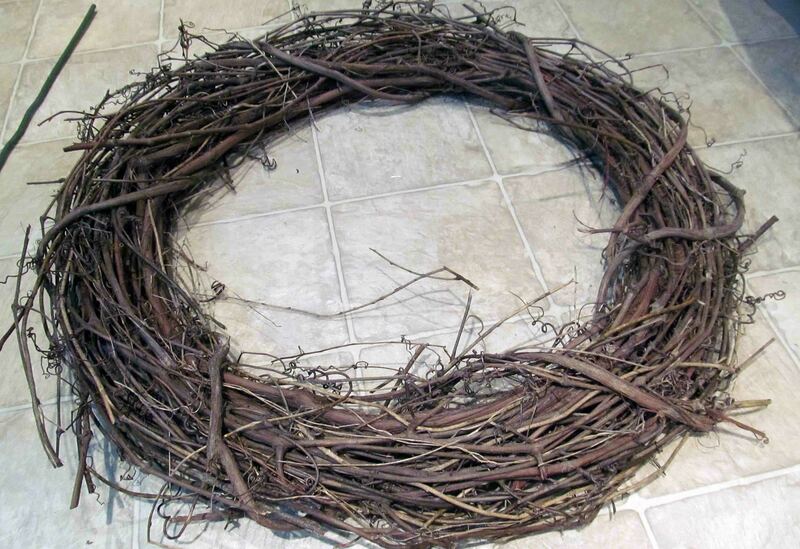 We got a grapevine wreath, lots of flowers, a wreath hanger and green wire. I set the wreath on the floor and started to plan out how I would place the flowers. We picked purple and green hydrangea, purple orchids, some big white flowers, and a few purple vines. After planning out my arrangement, I got to setting the flowers on the wreath. 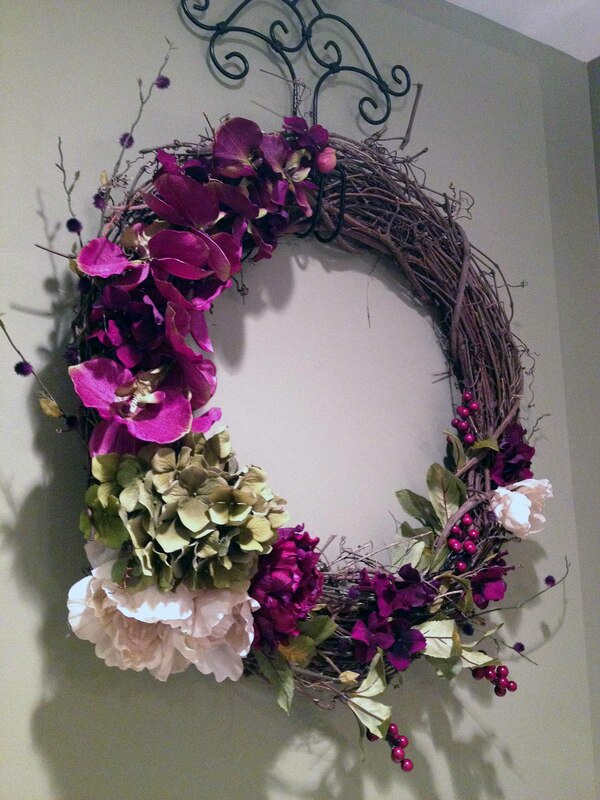 I started with the strand of orchids, cutting the extra wire down and placing it into the wreath. Once the orchid was stuck through the grapevine, I flipped over the wreath and tied the orchids to it with green floral wire. 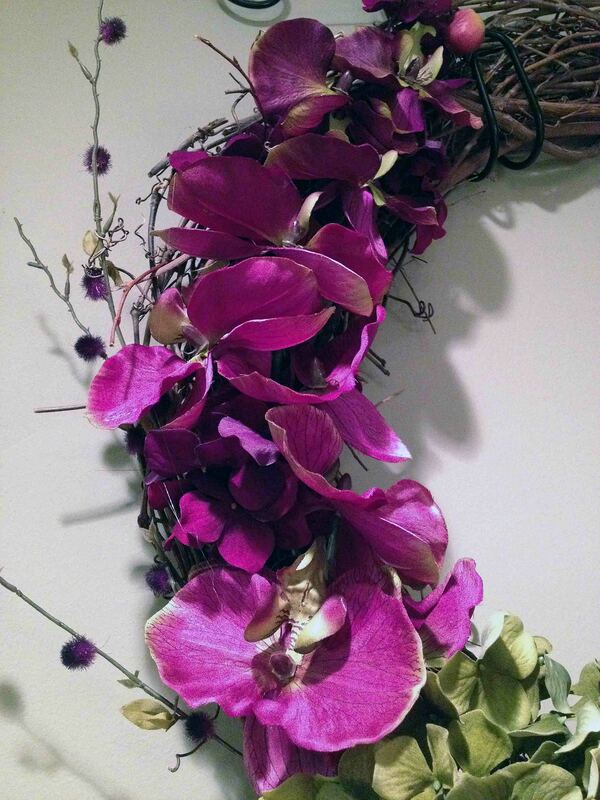 I tied the orchids in several spots, curving them along the natural cure of the wreath. 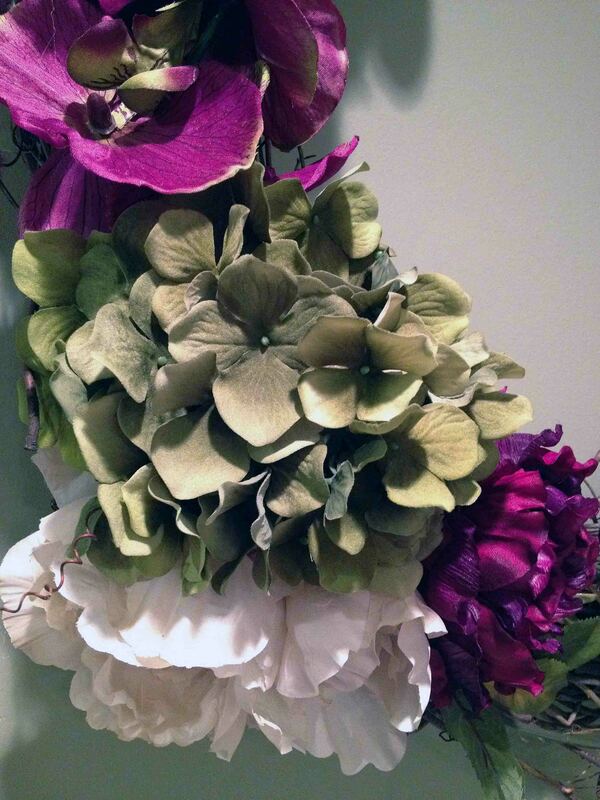 Then, I added the green hydrangea, two white flowers and one purple flower. Once my big-ticket flowers were on the wreath, I started to play around with the vines. I wanted to carry the flowers around more of the wreath, so I started weaving the vines in and our of the grape vines. 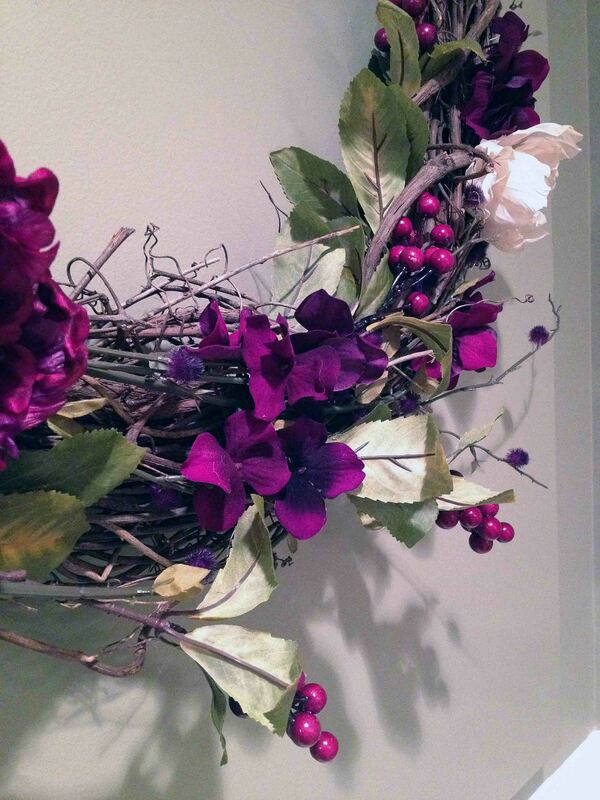 I used two different types of faux vine, both with purple accents. 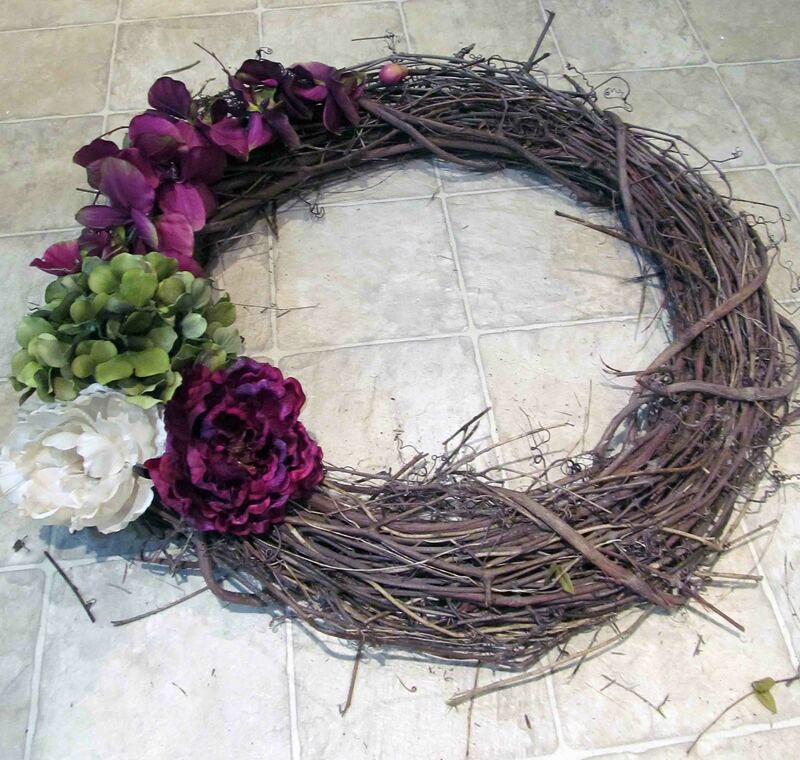 I then cut up the purple hydrangea and added it to other parts of the wreath. I secured all of the flowers with floral wire or hot glue. The large flowers I used both, and the small hydrangea buds I used only glue. Then, I drove the wreath over to Mom’s house. I am going over for dinner tomorrow night, but I couldn’t wait to show her what I made so soon after we bought the supplies — overall, this wreath took me about 45 minutes to make! Not too bad. 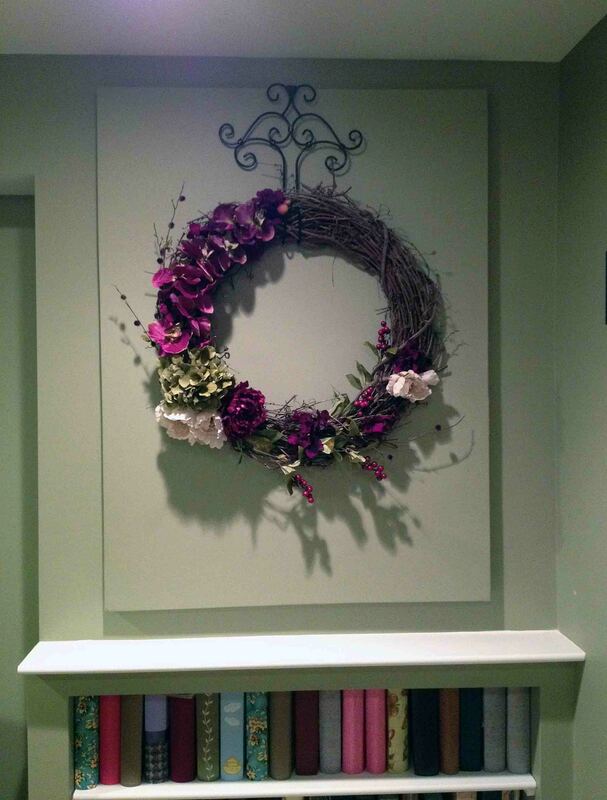 We took the wreath down to her basement, and it looked perfect. Ready to see the whole wreath!?!?! That’s it! I’m quitting my job and becoming a professional wreath maker. So much fun! Too bad they are pricey to make (the base alone was $9… dang. ).